Map scale description: 4'' : 1 mile or 8 Furlongs. The Bowles family were successful map publishers and sellers whose considerable output spanned a century. 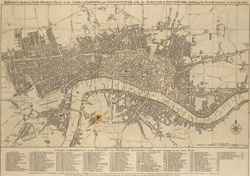 This map is the second edition of an original 1777 plan. It includes a table of references to churches and principal buildings. The built-up areas of the City of London are stippled. The scale is given in miles or furlongs.